99870376 – a dangerous parasite and infection carrier mite sitting on a green leaf. Protecting your skin in the summer requires more than just sunblock. Using insect repellent and knowing how to handle tick bites will safeguard you against tick-related illnesses. A tick is a small spider-like insect that bites and latches onto the skin and feeds on blood. They are most active in early spring to late summer and in areas where there are lots of trees, brush, plants, tall grass or furry animals. Some people may experience a mild allergic reaction to a tick bite – and in some cases, people may experience a severe allergic reaction, paralysis or worse. 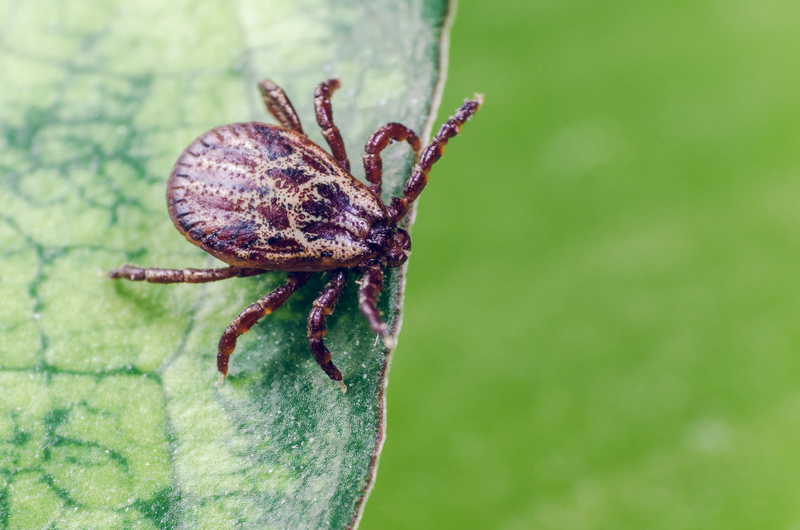 Tick bites can cause infectious diseases, such as Lyme disease. Lyme disease is the most common tick-related disease in New York City. In 2016, there were 946 confirmed cases of Lyme disease – 51 in the Bronx, 322 in Brooklyn, 322 in Manhattan, 128 in Queens and 123 in Staten Island. Symptoms of Lyme disease include fever, headache and a skin rash. If left untreated, the disease can spread to the joints, heart, and the nervous system. Dr. James Leach, Director of the Dermatology Department at NYC Health + Hospitals/Lincoln, gives advice on how to prevent tick bites, what to do if you are bitten by a tick, and what to look out for after a tick bite. Cover your skin as much as possible in areas that may have ticks. Wear light colored clothing as it will be easier to notice them if they get on you. Tuck pants into socks and shirts into pants. Wear a hat to prevent ticks from attaching to hair and scalp. Wear gloves while gardening because ticks can live under soil and among leaves. Apply insect repellent that contain DEET, picaridin, IR3535, or oil of lemon eucalyptus on exposed skin. Parents should apply repellent to their children, avoiding hands, eyes and mouth. Apply insect repellent that contains permethrin to clothes, shoes, boots, socks, tents and outdoor gear. Permethrin kills ticks that come in contact with treated clothing and gear and usually stays on even after several washings. Speak to your veterinarian about applying flea and tick repellent on pets. Do a thorough body search for ticks on yourself, children and pets, especially in areas such as around ears, around the neck, on hair and scalp, in the navel, around the waist, behind knees, between the legs and in other skin folds. Check clothing and other gear for ticks. Tumble dry clothes in a dryer on high heat for 10 minutes to kill ticks. Wash clothes in hot water to kill ticks. Wash skin treated with insect repellent. Shower within two hours of coming indoors to find crawling ticks on body and to wash them away. Use a pair of tweezers or your fingers shielded with tissue paper or rubber gloves to gently grasp a tick as close to the skin as possible. Do not handle ticks with bare hands. Do not grab, twist, squeeze, or squash the body of the tick. This may cause the tick’s mouth to break off and remain in the skin. Carefully pull the tick up with slow, even pressure to gradually remove it. After removing the tick, wash the bitten area and your hands with alcohol or soap and water. Place the tick in alcohol or in a plastic zip lock bag and store in the freezer for identification. Your doctor may request to see the tick if you are experiencing symptoms from the bite. Tick paralysis is a condition passed on by a tick bite. Symptoms are mostly found in young children. Symptoms can start with fatigue and numbness in the arms and legs and evolve into paralysis of the arms, legs, tongue, and face. These symptoms go away once the tick is removed. The most common symptoms of tick-related illnesses are fever/chills, a rash, headache, fatigue, joint pain, muscle aches or muscle weakness (palsy). Please contact your doctor immediately if you or a family member are experiencing symptoms from a tick bite. Click here to find a doctor: https://www.nychealthandhospitals.org/doctors/or check https://www.nychealthandhospitals.org/health_care/for health care locations.